Dive into a slice of Sweet Potato Pie sans the calories, fat and added sugar! 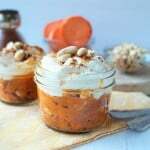 This Sweet Potato Pie Yogurt Parfait is the answer to your prayers. You're welcome! Preheat oven to 375*F and bake sweet potato for 20-30 minutes, or until soft. Remove skin and whip sweet potato using electric mixer. Add in cinnamon, vanilla, peanut butter and sugar, if desired. Stir in 1 tablespoon of crushed peanuts. Divide into half portions and place in bottom of small jar. Top each with 1/2 cup Greek yogurt of choice.